LBD & ONESIES - A Lifestyle Blog: Romwe's Shirts and Shorts $9.99 Sale! 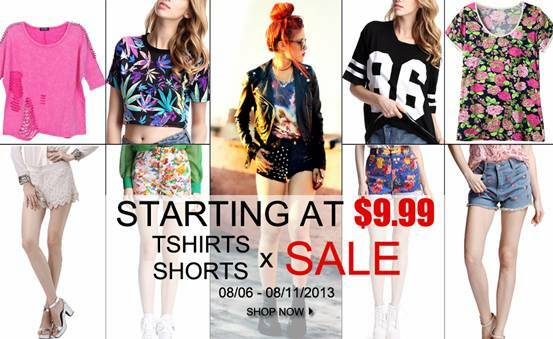 Romwe's Shirts and Shorts $9.99 Sale! You can never have too many shirts and shorts. They're the comfiest thing you could ever have in your closet. What I love about Romwe's basics is that they are not your typical basics. Their items have that extra something that could make them fashionable and street-style-ready on their own. Good news for everyone! Romwe's having a huge sale on their basic items from August 6 until August 11 only! So many hot items are waiting for you: Dollar Sign Print T-shirt, Skull Hand Black T-shirt, Simpson Print Denim Shorts, etc. for only $9.99 and above!